Rhodes is a beautiful island with variety of places to visit and adventures to live. An island which is ideal not only for those who want to relax but also for those looking for an action-packed holiday! A lot of places are worth viewing but if your vacations are not so long then you have to visit specific places that will help you understand the beauty of this island. There are plenty of beautiful beaches, valleys, villages, numerous cultural and archaeological sites to visit. Now we are going to take a look at the top picks. 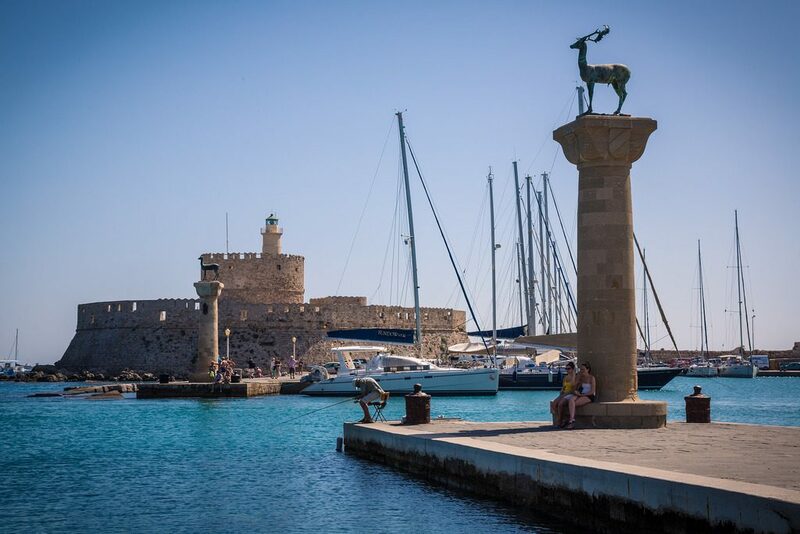 As you enter one of the largest medieval towns in Europe, it soon becomes obvious that the Old Town of Rhodes is a mosaic of different cultures and civilizations. Rarely does a visitor have the chance to stroll within medieval walls and explore twenty-four centuries of history. The fascinating medieval fortress-like buildings, the bastions, walls, gates, narrow alleys, minarets, old houses, fountains, tranquil and busy squares make it feel like you have stepped back into the medieval times. The Palace of the Grand Master is certainly the highlight of the Old Town. While in the old town you definitely have to walk along the Street of the Knights, one of the best preserved medieval streets in Europe, packed with medieval inns that used to play host to the soldiers of the Order of the Knights. Outside the walls of the Old Town lies the “new” city, with its magnificent Venetian, neoclassical and modern buildings. Amongst the most remarkable buildings that keep the memories of the island’s Italian period alive are the Post Office, the town hall, the police headquarters, the casino and the aquarium. A modern city, with a shopping centre, large hotels and resorts, numerous cafes, restaurants, clubs, impressive sights and attractions. A stroll around Mandráki, the small marina with the Rhodian deer statues at its entrance and the surrounding windmills, is an experience not to be missed. A visit to the Aquarium, one of the most important marine research centres in Greece, is a must! In the underground aquarium, reminiscent of an underwater cave, the visitor can see many of the species living in the Aegean. Saint Stefanos Hill (known as Monte Smith) marks the site of the Acropolis, one of the most important centres of worship, education and recreation in the ancient times of Rhodes. At the top of the hill you will also find the remainings (ruins?) of the Temple of Apollo, a Hellenistic stadium and a gymnasium. 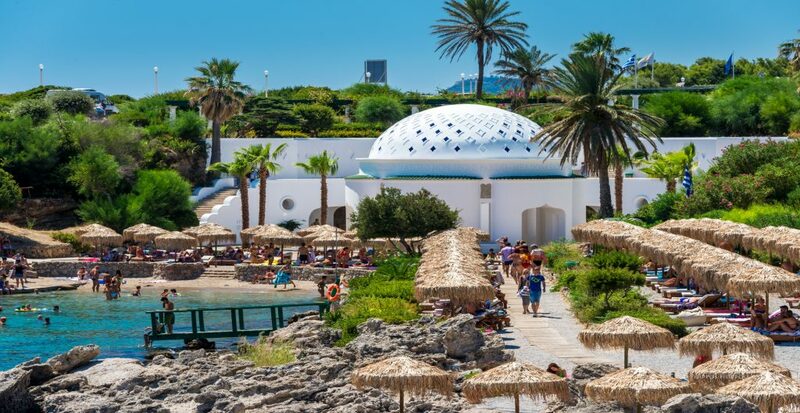 Known since antiquity for their therapeutic properties, the thermal Springs of Kallithea were utilized by the Italians, in the early 20th century. The initial premises were inaugurated on July 1st, 1929 and remained in operation until 1967, being very popular and attracting visitors from all over the world. The thermal springs of Kallithea in Rhodes, were well known since the Ancient Greece times for the beneficial properties of their waters springing up from the surrounding rocks.The unique architecture of the Kallithea Springs complex and the grandeur of the space, with the pebble stone mosaics, the Rotonta Hall, the terrace, the impressive patio and the staircases at the entrance create a nostalgic cinematic backdrop. 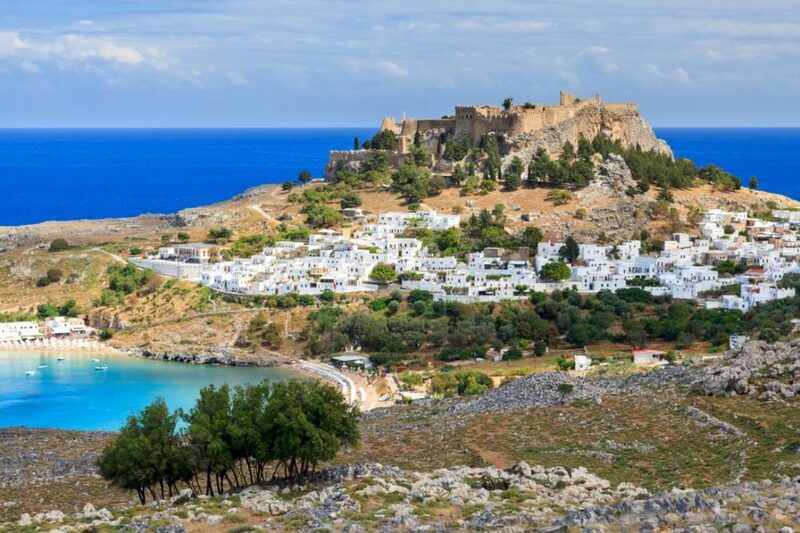 The ancient acropolis of Lindos is one of the most popular shrines of antiquity, surrounded by walls constructed by the knights, standing 116m above sea level. Here you’ll admire the impressive Doric Temple of Athena Lindia, built in the 4th century B.C. The village of Lindos, built on a slope, is the most attractive and one of the highlights of the island. During the summer, its little streets fill with visitors bar-hopping and window-shopping or buying gifts, like the island’s famous decorative plates. 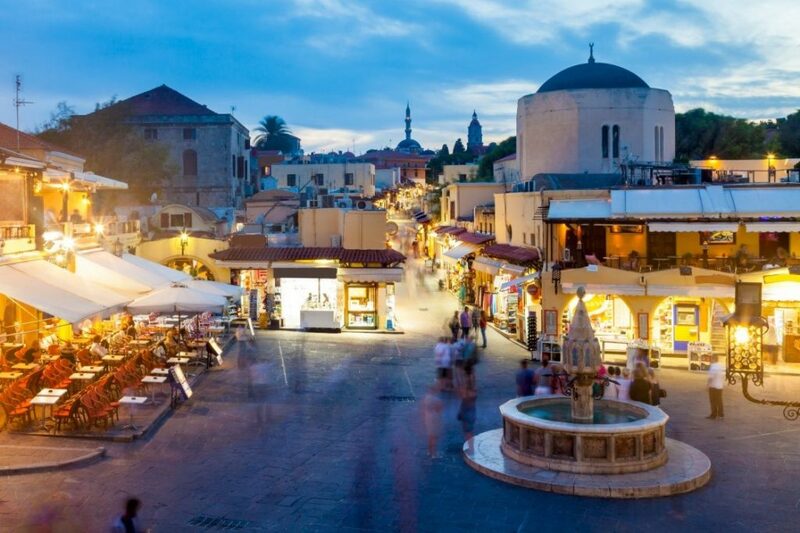 This picturesque town should definitely be on your list of things to do in Rhodes.